For those of you who only come for the Friday Night Fight I haven’t been comic reviews this week because I’ve been trying to further organize my crazy comic collection. I have comics here, there, over there, some over there, some in here…it’s a total mess! Even my comic review order turns out to be messed up thanks to this collection, but I’m discussing that over at my other website, The Clutter Reports. (Link in the footer.) This means I just grabbed the nearest comic I thought would have a fight and took what I could get. What I got was an anthropomorphic Marvel Universe featuring a less obnoxious Spider-Ham than main Marvel readers have been exposed to. His opponent? The Hobgobbler, who has kidnapped music and variety show star Barbara Mandrill. Don’t worry, that’s all the crazy we’ve got today. My brain is rather tired. 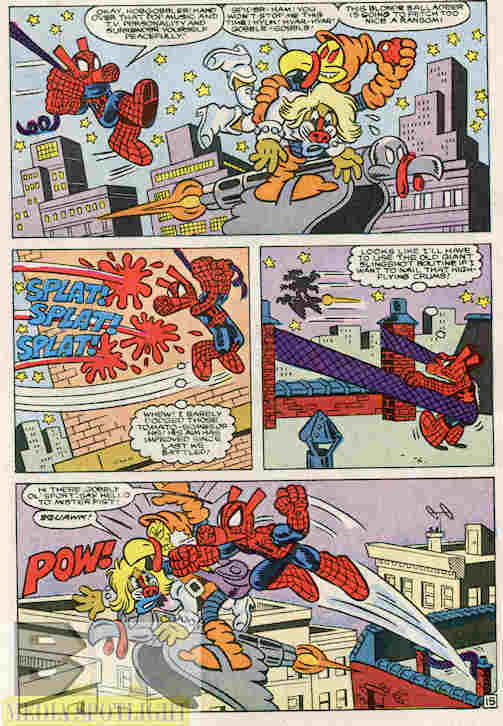 The Battlefield: Peter Porker: The Spectacular Spider-Ham #15 (Marvel/Star Comics; May, 1987) “To Oink Or Not To Oink” or “The Days Of Swine And Roses”, two titles that have nothing to do with this story but the writer apparently only cared to make pig puns for his title. We join the action in progress, because there wasn’t much more progress than I had in the intro section. With Spidey’s jokes I’m surprised more villains don’t throw tomatoes at him. Hopefully comic reviews return next week. More on that on Sunday. Head to Spacebooger.com and vote for your favorite Friday Night Fight! Winners of these 12 rounds head to the Prize Fight, so feel free to join in. We could use the competition. Rules and the previous round’s winners are posted on Tuesdays. Posted by ShadowWing Tronix on December 29, 2017 in Friday Night Fights, Marvel Spotlight and tagged Friday Night Fights, Hobgobbler, Hobgoblin, Marvel Comics, Spider-Ham, Spider-Man, Star Comics.